HomeDid You Know That A Third Tower Collapsed On 9/11? Virtually everybody in the world knows WTC 1 and WTC 2 were each hit by airliners and collapsed on the morning of September 11, 2001. But it’s estimated that only 5% of America knows that another building, WTC 7 was also destroyed on that fateful day. That statistic leaves me in an inexorable emotional paradox; simultaneously baffled but not surprised given that the media propaganda machine controls the narrative. ‘Never forget’? 95% of us don’t even know all there is to remember. WTC 7 was a 47 story steel building that had no jet airliner crash into it, yet it disintegrated along with the other two towers on September 11th. To give perspective on the building’s size, it would be the tallest building in 33 of the United States. I write this blog because in the years since that disaster I’ve come to realize that most of the people I talk to don’t know a third building was lost that day, and by extension those same people are unaware of the official story that fires destroyed it. The problem with that is no steel constructed building in history has EVER collapsed because of fire. Below is the Windsor Tower in Madrid, Spain. 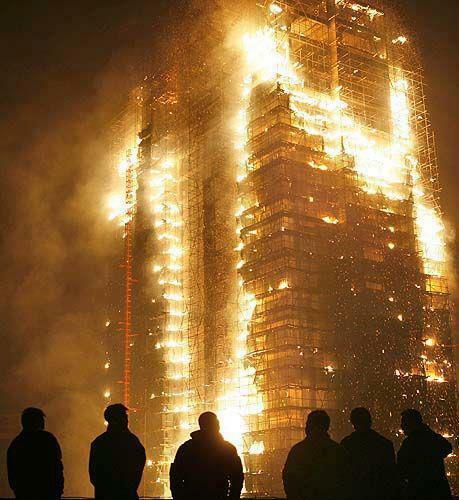 This 32 floor steel structure burned for 24 hours in 2005 and only partially collapsed. It didn’t have a sprinkler system because they were being retrofitted and were not in operation. Below is the Beijing Cultural Television Center. 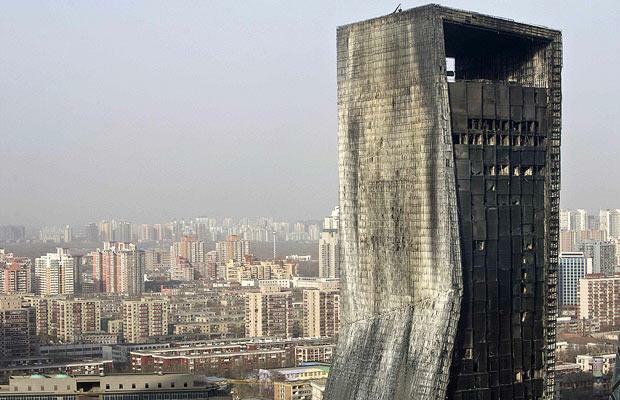 This uncompleted 522 ft. skyscraper burned for almost 6 hours because of highly explosive fireworks set off for the Chinese New Year. Six hundred firefighters were on hand to combat it, one of whom lost his life in the process. It did not collapse, though it looks like it should have. Click on this link to 9 – 11 Research, a website that shows examples of other skyscrapers that have burned but did not collapse. 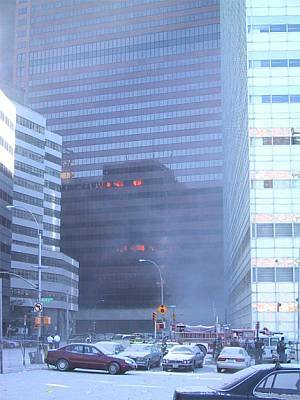 It’s been noted that this angle of WTC 7’s collapse does not show the more intense fires that were burning on the north face of the building. I feel this fact actually raises even more questions because a fire that would have been necessary to burn with such intensity as to collapse a structure of this strength and size should have completely burned through the whole building and roasted it like a marshmallow for several days. Even then it still wouldn’t have collapsed the tower. Another case to be made on that point: if the fire was only partially burning the building, is it not logical that the building should have collapsed unevenly? Instead of almost straight down into its footprint like in the GIF above? Again, that is entertaining the assumption that fire was capable of bringing down the building at all. Also, keep in mind that this building DID have a fire sprinkler system, and should’ve been able to extinguish fires in the structure such as in this photo. The official explanation is that they malfunctioned because of damage done to the city’s water lines in the collapse of the other two towers. Read the official explanation of the WTC 7 collapse from NIST (National Institute of Standards and Technology), a federal agency within the U.S. Department of Commerce and draw your own conclusions. These buildings are engineered to maintain structural integrity through intense fires, as has been proven numerous times over the decades. WTC 1 and WTC 2 were even designed to take multiple impacts from jet airliners. For more perspective watch this short but popular youtube video that has 1.7 million views. The body of evidence for conspiracies from countless angles on the subject of 9/11 is vastly abundant on the internet. Again, my intention with this post is to simply announce that there was a third tower that fell on 9/11 and to question the official explanation. The 9/11 Commission Report barely touches the subject of WTC 7. What are they trying to hide? I’m not going to draw any conclusions as to why in this post, but I encourage everyone to research it for yourselves. There are mountains of information on that subject alone. In conclusion I’ll leave you with the most compelling researcher on this subject, who engages in empirical evidence for her book Where Did The Towers Go? : Evidence Of Directed Free-Energy Technology On 9/11. And of course her book is a must for your library. Dr. Judy Wood, B.S., M.S., Ph.D., deserves a post of her own. To quote her words, “Empirical evidence is the truth that theory must mimic.” I encourage everyone to share this knowledge and help humanity learn the Truth for their collective self. There is widely circulated video showing a BBC news reporter detailing the “collapse of Building 7 minutes BEFORE the event actually happened, WITH BUILDING 7 STILL VISIBLE BEHIND THE REPORTER. That video is the smoking gun on what was obviously a scripted event whose timetable went awry. There’s an arsenal of smoking guns with the disintegration of WTC 7 but that one is an a-bomb for sure.